This is the second video in the series of creating a mini clock from pattern to finished project. Make sure you check out the first video where I show you how to create this pattern in Corel Draw. You can get the free downloadable scroll saw pattern from the link below. In this this video I take you into the workshop to cut the mini clock pattern. I demonstrate a few tips for new scroll sawyers that will help you be more effective with your cutting. The possibilities for creative mini clocks are endless. Customize the pattern and have a unique gift or craft to sell in your local show.
. Klockit has a nice selection. Link to free downloadable Scroll Saw Pattern. In this video I will continue to show you how to create patterns with Corel Draw. This will be a two part series. In the second video we will go to the workshop and cut the scroll saw pattern I create here. There will be a free downloadable pattern posted with the next video so be sure to check back. The pattern I create here is a mini clock. 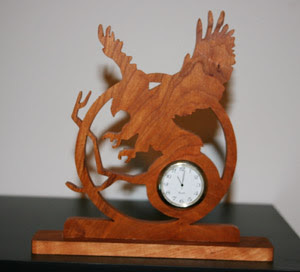 Mini clocks make great gifts and sell well at craft shows. You can easily customize the pattern to suit your local interest. This scroll saw pattern could also easily be reproduced with the free vector graphics program I showed in a previous video. Check out www.inkscape.org for details. Have fun with this project and check back often for more.